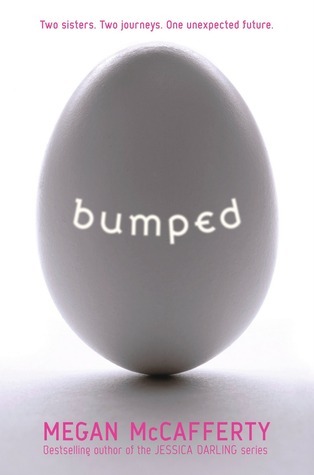 Bumped is a controversial and interesting read which I enjoyed. The first thing that will hit you instantly when you read this book is the slang used. It's teenagery, cringy and brilliant all at the same time. It does take some getting used to but once you get into it you don't notice it at all. The thing I found most fascinating with this idea is that, unlike some dystopian fiction, I could actually see how this could happen. The whole world built up around the twin main characters is a bit too realistic at times and makes for quite uncomfortable reading at times which is one of the reasons why I liked this book as much as I did. The whole idea of the sexualisation of teenagers and brainwashing them to become breeding machines is both frightening and insightful. I loved how the story was told via a double narrative. The twins themselves start the story as different as they can be but as the story evolves you start to see that they aren't all that different and the way they deal with the situations they are in are actually quite similar. The story itself flowed along well and kept me engaged quite happily so much so that I finished it with the space of a few hours. All in all a book I would recommend if not nothing else for the message it is trying to put across. I am certainly looking forward to the sequel. I haven't read this one yet, but have read some of the other reviews. I like what you have to say about the book, very thoughtful. Will have to keep an eye out for it. I agree, its a really clever idea and message that comes through! You certainly cringe at parts where you could see it happen! I adored this book. The sheer amount of thought and preparation that went into the world-building was wonderful to read, and I enjoyed how McCafferty presented both sides of the coin as being equally valid ways to live, that one way was not inherently better than the other. Loved it, and I highly recommend it! I agree, I can totally see something like this happening... I could still see our world in Bumped which doesn't happen that much in Dystopian's for me but it was great! I couldn't get into this one. I found the names of the girls too similar and I'd start reading a chapter and then flicking back to the chapter heading to see which girl was telling me the story and kept getting them confused. I've passed it along to someone else to guest review it, but I'm really quite disappointed as I was really looking forward to this one.